Bread From Heaven Cafe, Inc is a non-profit organization aimed at making our world a better place by helping feed individuals and families who may he be hungry but have no means of satisfying that hunger. If you would like to help support us in our effort to feed individuals and families in need, please make donation online below. 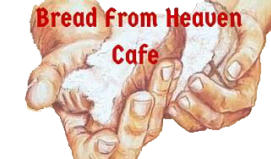 Bread From Heaven Cafe, Inc is a registered non-profit 501(c)(3). Donations are tax deductible as allowed by law.